SAN LUIS OBISPO, Calif. -- Evacuation orders were issued after a brush fire along the border of Santa Barbara and San Luis Obispo counties exploded in size Saturday to 19,000, officials said. The so-called Alamo Fire was 10 percent contained as of Saturday morning, according to an update published on Santa Barbara County's official Twitter account. Located off Highway 166, near Twitchell Reservoir, the wind-driven fire was reported about 3:30 p.m. Thursday. It was being attacked by about 1,000 firefighters, four fixed-winged planes and five helicopters. Four bulldozer teams, 10 hand crews and five water tankers were requested at the scene. Among the responding personnel were fire crews from Los Angeles and Orange counties. 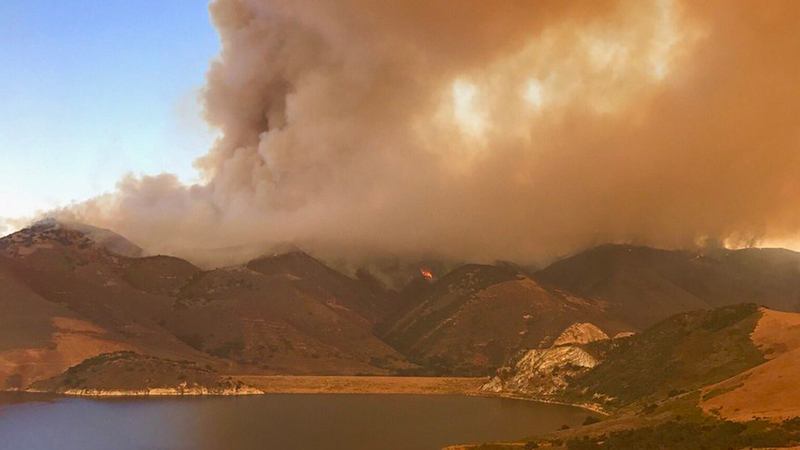 About 150 to 200 homes were threatened by the flames, which jumped Oak Canyon overnight and were fueled by tall grass and drought-stricken vegetation. Evacuation orders were in effect for the Buckhorn area, Blazing Saddle and White Rock lanes, and Tepusquet Road south of Blazing Saddle to Santa Maria Mesa Road.